Have you ever felt that you get less done when you multitask? You’re not imagining things. In fact, Larry Kim, founder and chief technology officer of Boston-based online marketing company Wordstream, points out in an article for Observer that you’re actually hurting your brain by juggling several undertakings at once. Since we aren’t wired to focus on more than one thing at a time, cramming multiple tasks onto your to-do list will actually slow down your cognitive processing. You’re unable to organize your thoughts or filter out unnecessary information. As a result, your efficiency plummets—and so does the quality of your work. In fact, one study at the University of London revealed that subjects who multitasked while performing brain-intensive tasks demonstrated IQ drops similar to people who are sleep-deprived or smoke marijuana. Still not convinced? Multitasking is also linked to increased cortisol production, a stress hormone that leaves us feeling tired when we need energy to concentrate [PDF]. Once we start multitasking, it’s hard to stop. Each time we complete a small task—sending an email, tweeting, etc.—our brains are blasted with a dose of the reward hormone dopamine. It feels good, which means we’re likely to keep bouncing back and forth between tiny, unimportant goals without getting anything major done. And even if we’ve set aside time to delve into a time-consuming project, the mere knowledge of a new email or text lurking in our inboxes can keep us distracted. According to some research, this constant anticipation can actually lower our IQ by as much as 10 points. One study from the University of Sussex in the UK indicates that forms of multitasking can cause cognitive damage, Kim warns. MRI scans showed that subjects who consumed multiple media forms at once had less brain density in the anterior cingulate cortex, the region associated with empathy and emotional control. Scientists still haven't concluded whether or not multitasking is permanently harming our brains. However, there's overwhelming evidence that it harms our lives. How can we break this insidious cycle and form new habits? 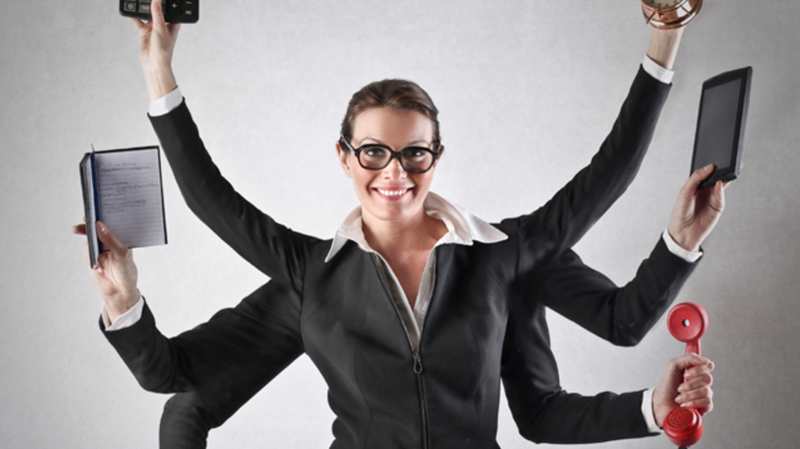 “Protect yourself from the multitasking mental massacre by establishing an e-mail checking schedule,” Kim advises. “Commit yourself to checking emails only three times a day (maybe when you get in to work in the morning, at lunch time, and before leaving work at the end of the day). Turn off texting notifications and choose specific times to check your phone as well.” This way, you can buckle down and focus on the things that really matter.